I presented the results of our member survey on the proposed tax increases to the city commission Monday evening, along with arguments on why such large increases, particularly in the payroll tax, is harmful to business. 77% of those who responded to the survey were opposed to these increases. The poll was conducted and open eight hours on the Friday of Memorial Day weekend. Roughly 9% of you took the time to answer three short questions. Your public policy chairman Rick Waldon had comments that I shared with the city commissioners found here . My comments to the commissioners are here. Commissioners Atkins, Terry, Serres and Mayor Perros voted for the increases. A detailed budget and the capital projects can be found on the city website here.. Mayor Perros said he would welcome suggestions as to how the budget could be cut significantly enough to remove the need for new taxes. The Advocate Messenger story on the commission meeting can be found here. There is still time to get a team together for our 28th Annual Golf Tournament, presented by Community Trust Bank, this Monday, June 19. 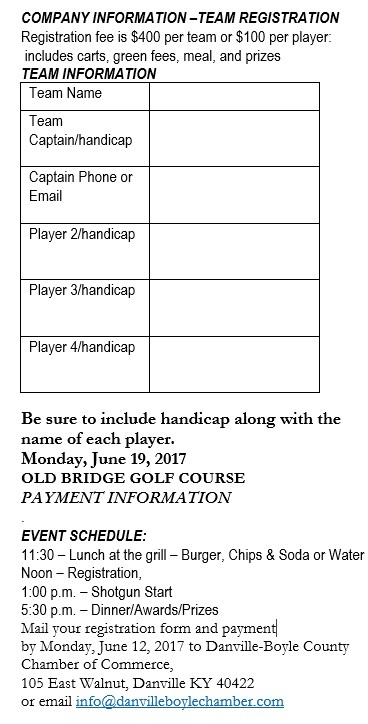 Play is at the Old Bridge Golf Course and begins with a shotgun start at 1 p.m. (Registration is at 12 noon.) Golfers will have lunch at the Grill, courtesy of Northwestern Mutual, beginning at 11:30 a.m. The event concludes with a dinner sponsored by Cheddar's Scratch Kitchen. Teams of four are $400. This is our second largest fundraiser for the Chamber. We need the community support every year with our fundraisers because our annual budget is built through our member investments and our fundraisers. We receive no public funding. We hope you will come out and join us! Call the Chamber at 236-2361, ext. 120, or email info@danvilleboylechamber.com to enter a team. Other sponsors include: Ephraim McDowell Health, Fort Knox Federal Credit Union, Bluegrass Community Bank, Team Construction and Martin Contracting, as well as hole, team and door prize sponsors. On Tuesday morning, June 20, we will hold a follow-up meeting for a second Community Conversation on Workforce Development at 8:30 a.m. The purpose of the initial meeting was to take the first step toward developing a concerted, coordinated community-wide effort to identify and seek solutions to the obstacles that impede individuals from obtaining and retaining employment. The intent is for a series of meetings to follow that will create and implement action steps by early fall. All agencies who attended the first one, as well as others interested in workforce development, are invited to attend. RSVPs to the Chamber office at 859-236-2361, ext. 120, are encouraged. The 2018 Danville Livability Magazine planning is underway. Rhys Simmons with Livability Media will be contacting you about sales opportunities - both in the magazine and digitally - over the next few weeks. I hope you will schedule a time to see him and learn of the many new offerings to help promote both your business and the community through our annual publication. Congratulations to the Great American Brass Band Festival committee for a wonderful and successful festival. The four days were picture perfect "chamber of commerce" weather days. Crowds enjoyed everything from a Chautauqua Tea, Quilt Show, and children's events, to the picnic, concerts, Bayou and Brass, hot air balloon race, (to name a few of the many activities! ), as well as all the brass band concerts. Tom Tye,owner of Tye Financial Group located at 141 North Third Street in Danville, hosted the Friday, June 9th Business After Hours, from 4:00 - 6:00 p.m. Members networked and enjoyed BBQ. The office was also a Stop on the Gallery Hop, coordinated by the The Arts Commission of Danville/Boyle County. Caretenders Home Health located at 101 Ponder Court, Suite A in Danville, held a ribbon cutting. Dawn Cheetham, Director of Professional Services, cut the ribbon and Heather Hall, Patient Care Liason their staff, along with Chamber ambassadors were present. Caretenders offers nursing services, medication management, wound care, cardiac care, rehabilitation services, social services, home health aide and care coordination. They can have an RN assessment within 24-38 hours of discharge, they also provide anything from medication management to meal preparation. They will also coordinate care with private duty services including transportation and home medical equipment. The 10th Teachers Academy was held June 6-8, 2017. Teachers from Danville, Garrard, Lincoln and Mercer school systems spent four half day touring local business and industries to learn about the workplace and/or career opportunities of today - and in the future . Teachers had the opportunity to ask questions and to get first-hand experience inside today's high technology businesses and see what is required in employees. Teachers also learned about the skills and education required and the career paths and salaries that can be earned. At the closing session, a round table featuring Central Kentucky Society of Human Resource Managers from our business community, allowed teachers to ask questions of businesses that they were not able to visit and discuss issues such as "soft skills", interview skills, and drug testing. For employers, it was an opportunity to address the most important messages that, from a business perspective, need to be communicated to students about the workplace and/or career opportunities of today - and in the future. At the Opening Session, teachers were giveninformation on workforce needs and resources including a tour of BC &TC and Guided Reflection Questions to use throughout the three days of visits. Employers were prepped to share what they are looking for in prospective employees. We want to say a special thank you to participating businesses for the site visits. They were: the City of Danville, LGE-KU E.W. Brown Plant, Wilderness Trail Distillery, National Office Furniture, Farmers National Bank, Inter-County Energy Cooperative, Meggitt Aircraft Braking Systems, LSC Communications and DecoArt. Pioneer Playhouse has been awarded a $15,000 National Endowment for the Arts grant for Voices Inside Prison Outreach Program. Read the story here. Happy 7th Birthday to Bluegrass Pizza & Pub. Colin and Melissa Masters have great brick oven pizzas, sandwiches, appetizers and craft beers in a beautiful and unique setting. Thank you for investing in our community! Wishing you much continued success!